Are AV Producers Part of Your Future? One of the big topics in AV Staging today is about where to draw the line between staging and production. Most stagers do not want to be seen as a competitor by their customers, so choosing which services to offer is a balancing act between the demands and needs of a diverse group of clients. The traditional view is that the lines of production are somewhere inside creative, content, and delivery. Producers are responsible for creative and content, while stagers take on delivery. There was a time where this line was very clear, but not any more. AV Producers are in a challenging position. Every technological advancement seems to threaten their value proposition. In particular, electronic slides, digital video production, and video conferencing have eaten away at their profit centers until there is not much left for them to sell other than some creative and coordination of vendors. On top of that, independent Technical Directors are encroaching on the coordination piece while customers are taking control of the content. Granted, the concept for a project can be a huge undertaking, but how many of those big, creative projects are out there? AV Stagers have known for years that many of today's production companies are shells for one or two executive producers, a couple of account sales persons, and perhaps a small support staff. The actual production is generally outsourced, probably to former employees. More importantly to the end client, the creative concept has become secondary to the costs of the event. In short, the number of big projects is shrinking, the number of full service producers is dwindling, the margins are getting smaller, and the big staging companies that compete for producer shows are beating each other up on price. On the other hand, the mid-sized stagers are growing fast and taking on more of the production role. Their primary focus is the corporate client that is relying on the stager to provide the theme, look, and content of the event. There are still producers involved, but often they are partnering with the staging company. According to recent surveys, the typical staging company with $4 million revenue is growing faster and earning three times the profit percentage of its larger counterparts. They also claim to have less than 60 percent of their revenue come from staging. (See the piece in this issue about InfoComm's Rental & Staging Survey, on sale now). Before you decide where your company should stand on this complex issue, consider what the industry will look like ten years from now. Who will your end customers be? Marketing pundits are already advising their clients to think of today's text messaging, blogging, twenty-something as the next CEO. These are people who think YouTube's video quality is adequate, listen to music on their cell phones, and grew up expecting, not just tolerating, but expecting, technology to fail. Computers lockup, cell calls drop, and the satellite dish goes out. (Ironically, you would never tolerate intermittent failure from your microwave oven, but you assume it in critical communications devices!) How will a generation that doesn't slow down enough to learn how to appreciate quality audio-visual experiences expect their meetings to be run? Now, take a good, hard look around. If you are a mid-size full service staging company, you either know of competitors that provide production services or you do so yourself. Some larger stagers may scoff at this idea, but at the same time they are embracing the interaction between media servers, LED displays, video projection, and lighting. The staging companies that excel in this area are already designing and producing the content to support their events. What definition of production are they using when they say they don't do production? Finally, what will a producer look like in ten years? If all the past contributions of the traditional AV Producer have become independent specialties, creative direction, content production, and project management, then it is likely the new producer is providing a level of consultation that rental companies are not equipped to do. On the other hand, rental companies could hire, or subcontract, a producer when needed. There will always be producers so I expect there will always be stagers who specialize in supporting production companies. But the core issue for staging vendors is: where is the line between production and staging and where is it going? There is no right answer, but there are some truths to consider. As you read this, traditional AV staging companies are producing turnkey shows for end clients. Many are selling creative concepts, logos, and meeting themes. Even more are providing graphic, scenic, and lighting design. And there are a few that have put Meeting Planners on staff to capture even more of the customer's work. What's next, travel departments? In the end these staging companies will get the rental business, but that is becoming a smaller piece of the pie. In a recent survey of people in the Rental & Staging segment, we asked how business was going so far this year. 32% say they have seen more than a 10% growth in revenue for the first quarter compared to the same quarter last year. 39% claim between 1% and 10% increases. 62% expect the remainder of the year to exceed last years revenues. This is all very good news unless you are one of the 28% of respondents for whom business is flat or down. 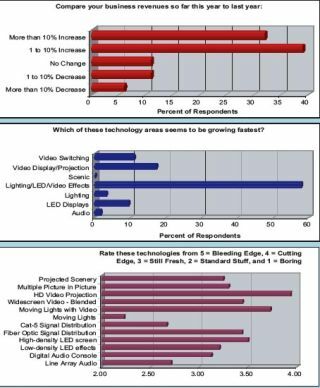 We also asked which technology areas seem to be growing the fastest and it should be of no surprise that 58% of the respondents said Lighting/LED/Video Effects was number 1. It is interesting that there was no association of this fact with a growth in scenery, but then AV folks have never been much in the way of scenery. In a related question we asked participants to rate a variety of applied technologies for their wow factor. HD Video Projection received the highest marks followed by Video Moving Lights and High-density LED. Fiber optic signal distribution came in neck and neck with blended widescreen video significant for a glue product (If you are still running copper to video projectors you are way behind the curve). Line Array Audio and Moving Lights registered just above ho-hum they have become standard tools. Finally the survey asked for comments on the Next Big Thing in event staging. There were a couple of responses about HD Telepresence something stagers should learn about. Peter Emminger, Production Manager and owner of Yellow Light Live went one step beyond, I see holographic effects being the next major technological breakthrough. The only current hurdle is cost, there have been at least two shows where the stage set was made of holograms. As the cost comes down, and the technology becomes user-friendly we'll see car shows where the car is a 3d hologram, rotating live in space as the presenter interacts with the image. I think this may only be 2 - 3 years away.